While the Bastion’s timbers are original, the interior represents activities of the early mining post from 1853 – 1862. Today, this former Hudson’s Bay Company building is a symbol of Nanaimo’s history. The Bastion is a “must see” destination for visitors to Nanaimo. The Bastion is open 7 days a week from May long weekend through Labour Day. The cannon firing ceremony takes place daily at noon when the Bastion is open. Group tours of the Bastion are available for booking during the off-season. The first floor is a representation of the sales and trade operations in the 1850s. The Hudson’s Bay Company constructed a series of buildings for specific purposes such as storage and trade. Some of the key activities conducted in those buildings are now represented here through a display of trade goods and other Hudson’s Bay Company artifacts. The second floor contains examples of the Bastion’s armament. As a defensive structure, the Bastion had two six-pount carronades for short range defense and may well have stored other firearms and gunpowder reserves. Along with the heavier cannons outside, their purpose was more ceremonial than defensive. The bell above the door on the outside of the second floor was originally mounted nearby on a nine metre pole, and was used as a signaling device, principally to announce the time, as watches and clocks were uncommon. The top floor provided storage for supplies but was also designated as a place of refuge for Hudson’s Bay Company employees and families. Today there is a display of the many kinds of objects that miner-colonists would have brought from Britain, as well as a display of the tools and construction methods utilized in building the Bastion. Left: The Bastion being moved in 1974. Right: The Bastion undergoing restoration work in 2010. The Bastion was constructed using the pièce-sur-pièce technique which uses timbers laid atop one another horizontally with tenons cut on each end. The tenons are inserted into vertical grooves in the eight vertical posts, while the bottom sill log was set on a masonry foundation. The structure was built using basic hand tools: a crosscut saw, broad axe, adze, auger and pit saw. As nails were expensive, few were needed using this technique. Logs were cut and squared nearby and hauled to the site and gaps between the logs were filled with chinking (straw or moss mixed with clay or mud) to keep out the rain and wind. Originally, the Bastion was situated on the present-day location of the Dorchester Hotel parking lot. However, by 1891, the land was sold and the new owner threatened to demolish the structure. A contribution of $175 from the city saved the Bastion and it was moved across Front Street. The Bastion was moved again in 1974 when Front Street was widened. Restoration in 2010 repaired and replaced some of the ageing parts of the Bastion, although the majority of the timbers and other components of the structure are original. 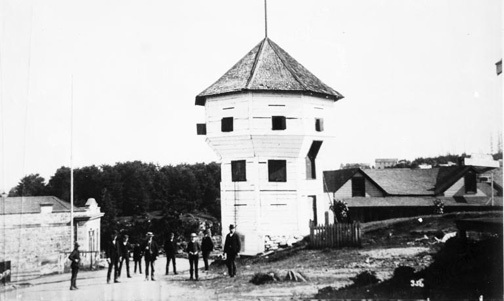 Nanaimo’s Bastion is the last remaining wooden Hudson’s Bay Company bastion in North America. Today, as the city’s oldest structure and recognized Municipal Heritage Site, and having survived multiple moves, renovations and changes in ownership, the Bastion proudly stands as one of the most enduring and iconic symbols of Nanaimo. The first log cabins are built in Nanaimo and the first coal mining operation is established under the direction of the Hudson’s Bay Company. To protect miners and their families, a Company ship was anchored in Nanaimo’s harbour, however this expense soon led to construction of the Bastion. Construction is started on the Bastion, which is completed the following year, in 1854. A large flotilla of Kwakwaka’wakw paddling from the north appears in the harbour, sending residents to seek refuge in the third floor of the Bastion, one of the few recorded defensive uses of the Bastion. The Hudson’s Bay Company’s licence for exclusive trade is not renewed, and three years later the governors of the Company sell the Nanaimo lands, buildings, machinery and mineral rights. 1863-1891: The Bastion is used intermittently by the colonial and later city governments, and, until 1871, is even used on occasion as a temporary jail. The Bastion is saved from demolition by a contribution from the city of $175 which moves it across Front Street. City of Nanaimo relinquishes its interest in the Bastion. Management of the Bastion is taken over by the Native Sons of British Columbia, a fraternal organization dedicated to preserving BC history and pioneer values and traditions. The Bastion is moved for a second time as Front Street is widened. The Bastion Museum Society takes over management of the Bastion. Renovation work is done on the Bastion and noon cannon firings begin. Exhibits and meeting rooms from the Native Sons of British Columbia are removed as structural and fire safety upgrades are done. Management of the Bastion is transferred to the City of Nanaimo, and the Nanaimo Museum recreates the Bastion’s interior to represent how it may have looked in the 1850s. The Bastion undergoes major restoration work, and for over six months is completely dismantled with several original and substituted timbers replaced. The Bastion was one of the best 100 buildings in BC, according to BC’s Best Buildings Contest. The historic structure placed third in the Vancouver Island region. BC’s Best Buildings Contest was hosted by the Architectural Foundation of BC.